Wang Qiu crouches low to the ground, bending over a large wooden mortar with a pestle in her hands. She puts a knob of ginger — its skin still on — into the bowl, along with chilis and a handful of bright green garlic chives, and starts to carefully pound them into a paste. 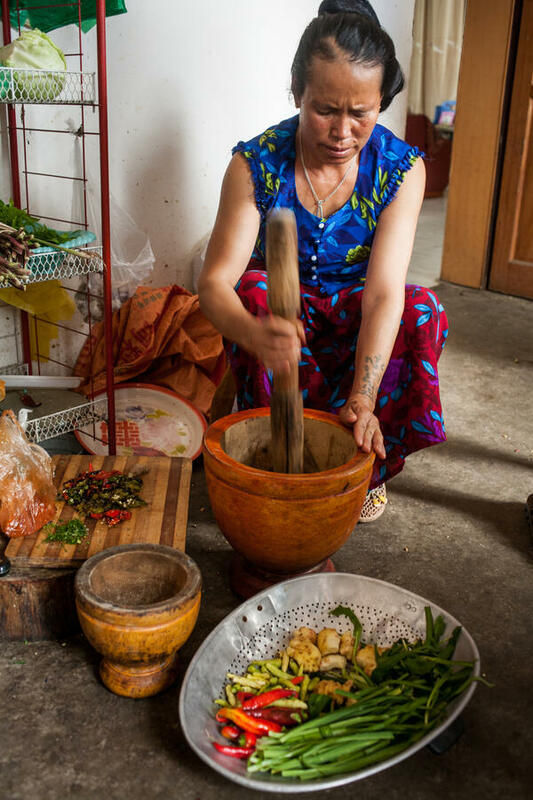 Although Wang, a Dai minority housewife from Menghai, cooks in a thoroughly modern kitchen, she still does much of her cooking while crouched down on the floor, where she cleans vegetables, makes a variety of herb and chili mixtures, and lays out squares of green banana leaves to stuff them with seasoned meat and fish before steaming or grilling them. For this dish, Wang coats the skin and flesh of the cleaned fish with chili-herb paste, then stuffs more inside and folds the fish in half, nose to tail, holding it closed with a split piece of bamboo and some lemongrass that she wraps around the fish to secure it and give it a nice aroma. Then she grills the fish outdoors on a long, low charcoal grill. The chili paste on the fish’s skin chars and browns as the flesh cooks, adding another layer of smoky, spicy flavor to the finished dish. This recipe comes to us from the new cookbook Cooking South of the Clouds — Recipes and Stories from China’s Yunnan Province (Kyle, 2018) which was written by former Kunming resident Georgia Freedman. The book gives recipes for classic and home-style dishes from across Yunnan, as well as cultural and historical information about the province’s minorities and photos of the many places that Georgia and her husband, photographer Josh Wand, traveled while researching this book over the course of five years. One of the most important tools in a Dai cook’s kitchen is a large mortar and pestle. Some cooks use a large wooden bowl and a hefty, two-foot-long wooden pestle. Others use a hollow piece of bamboo instead of a bowl, or a massive stone mortar, which is heavier and boasts a rough surface that helps break down the ingredients. Whatever the materials, the mortar and pestle can be used in a variety of ways — to smash peanuts that will dress cucumber salads, mash fresh or roasted chilis, tomatoes, and herbs into a piquant sauce to serve with raw vegetables, crush raw meat into paste, or mash grilled eggplant until it is silky-smooth. In this recipe, it is used to make a fragrant herb and chili paste. Dai cooks in southern Yunnan often grill foods over a small, low fire built into a cement pot called a huotang, or in a narrow metal trough. Both setups allow food to cook very close to the coals. If cooking on a Western-style grill, you’ll need to pile charcoal up so that it sits close to the grate to achieve the same results. 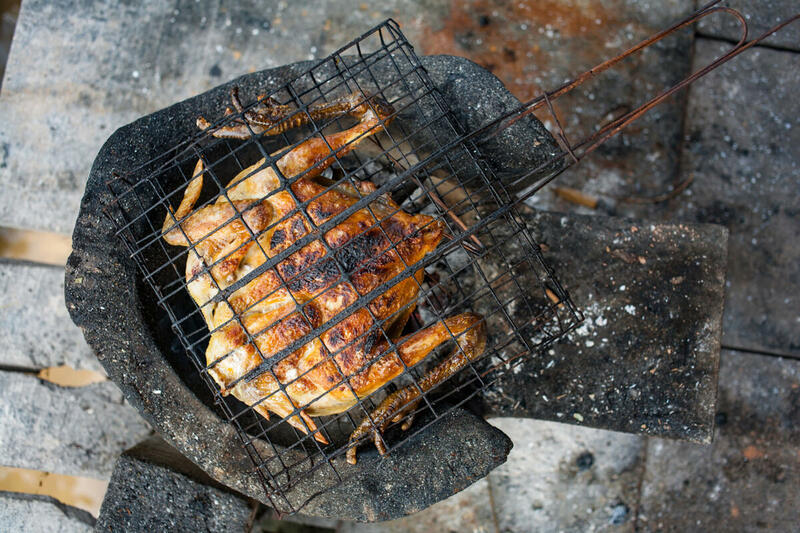 When cooking fish, chicken, or vegetables over a fire, Dai cooks hold them together by putting them in a grill basket of forming a clamp with a piece of split bamboo. This allows them to grill the foods without using a mesh or grate over the fire, while keeping foods like fish from falling apart as they are turned from side to side. 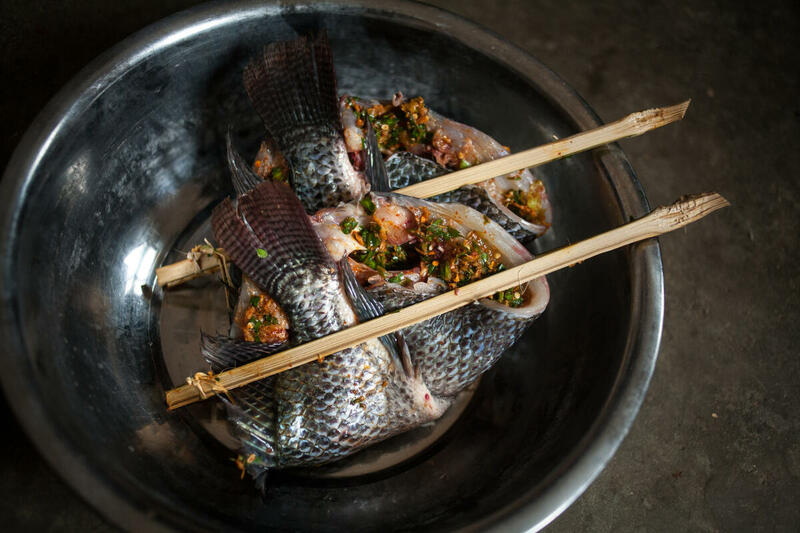 For this recipe, Wang uses tilapia, a white fish that is easy to raise and is farmed all across Asia, including in southern and western Yunnan. 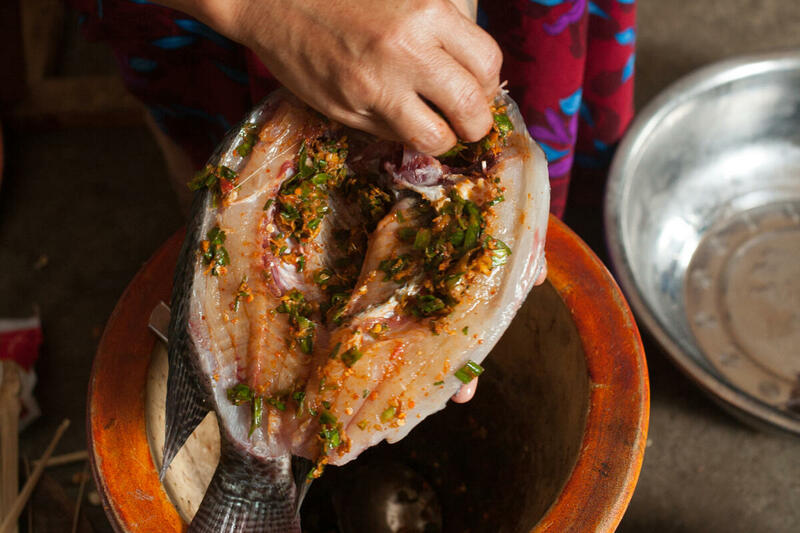 Tilapia are particularly good for making Dai dishes like this one because their mild flesh soaks up the flavors of any herbs and chilis that they’re cooked with. Wang also uses this same method — and same spice paste — to cook eel. To make the dish with eel instead of fish, have a fishmonger kill and clean the eel — removing the backbone — rub it with salt and fill each long filet with spice paste. Next, roll it up into an oblong ball, wrap these with a piece of lemongrass, and grill them the same way you would cook the fish, brushing them with oil and chili paste. 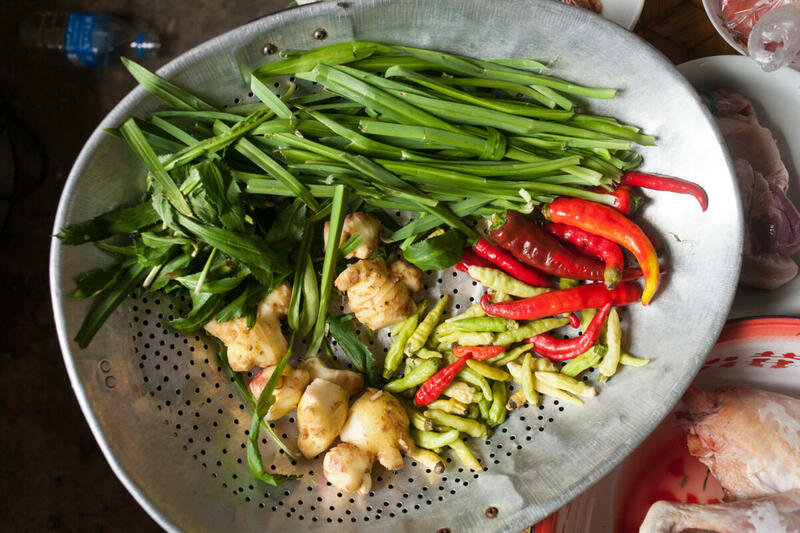 Dai cooking uses many herbs more commonly associated with Southeast Asian cuisines like Thai and Vietnamese. This recipe uses leaves of lemongrass, a tall tropical grass with a citrus-like smell and taste that is said to promote digestion and cool the body. Most recipes call for using just the tender inner parts of a lemongrass stalk. But, in this dish, the firm outer leaves are used to tie the fish together, adding flavor as they help the cook keep the meat intact during grilling. The small red chilis known as Thai or birds eye chilis in the West are generally called xiaomila in Yunnan. This name is used for a variety of different chili hybrids, all of which are small, thin and spicy, though the level of spice depends on the exact cultivar that you buy. Beware that some chiles sold by this name are hotter than others. Using a large mortar and pestle, mash the ginger, chilis, chile flakes, and one tbsp of the salt until the ginger and chilis have been shredded into small pieces. Add the garlic chives and smash everything until the ingredients are well-bruised and thoroughly mixed together. Rub each fish inside and out with approximately 1/2 tsp of the salt. Stuff the fish with the spice paste, then close the fish. If using split bamboo, fold the head of each fish over the tail, as if the fish were kissing the tip of its tail. If using a grill basket, close each fish back up so that it looks whole again. Smash the lemongrass leaves with the handle of a cleaver until they are pliable, wrap each fish in a leaf, and secure the fish with the bamboo or put them into the grill basket. Heat charcoal in a grill until the coals are hot. Cook the fish over direct heat for five minutes, using a pastry brush to brush them with the oil a couple of times, then flip them and grill the other side for another five minutes. Use the pastry brush to coat the fish with the chili sauce and grill for an additional five minutes on each side. The fish’s skin should be partially blackened and crispy, and the flesh should be firm, flaky and no longer translucent.